Believe it-or not-the extent of how much our personal beliefs and morals influence decisions is spurring academic inquiry. 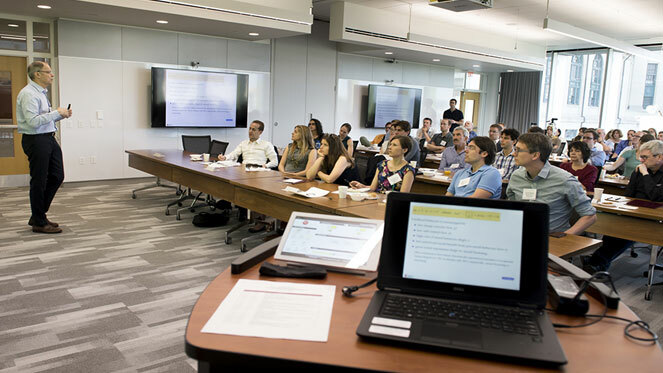 Carnegie Mellon University welcomed Nobel-prize winning economist Jean Tirole, John Bates Clark medal winner Matthew Rabin, New York University economist Andrew Caplin and other attendees to The Conference on Belief-Based Utility in June. Hosted by the Department of Social and Decision Sciences, the two-day event attracted top minds from leading institutions worldwide to discuss moral influence, self-image and sense-making and their implications for economics. "Many great economists and psychologists are recognizing that people care about and derive utility from their beliefs. We brought them together and initiated a highly stimulating conversation by organizing open discussions along with traditional presentations," said Russell Golman, assistant professor of social and decision sciences and co-organizer of the conference. "Research in belief-based utility could have incredible implications in the Information Age." George Loewenstein, a co-founder of the behavioral economics field and the Herbert A. Simon University Professor of Economics and Psychology, co-organized with Golman and said, "Phenomena like social media, belief polarization and fake news all call for new thinking about how people take in and process information and form beliefs." Tirole, who is chairman at the Toulouse School of Economics, gave the first keynote presentation, "Narratives, Imperatives and Moral Behavior," based on his research with Roland Benabou and Armin Falk. The talk presented his work in economic modeling to predict behavior based on the stories (narratives) and rules (imperatives) people choose to consume and follow. By giving examples of influential narratives from the past, such as Nazi propaganda, he emphasized a need to deepen and advanced similar research in modeling for the present. In the Information Age, narratives can be spread by anyone while also having the ability to impact reputations and to influence the behavior of others, for better or worse. "There is a need to understand how narratives are constructed, how they are shared and how they are spread," Tirole said. Caplin, the Silver Professor of Economics at NYU, presented on "Behavioral Data and Psychological Constructs." He emphasized the need to collect new kinds of data to test psychological and behavioral economic theories. Rabin, the Pershing Square Professor of Behavioral Economics at Harvard, gave the final keynote talk, "Making Belief-Based Utility Core Economics," which described his approach to modeling belief-based utility, building on existing models. CMU is well positioned to draw so many influencers from around the world in the behavioral economics field. The Social and Decisions Sciences Department is home to the first-of-its-kind undergraduate major in behavioral economics, policy and organizations (BEPO). The growing recognition of deriving utility from people's beliefs spurred Golman and Loewnenstein to organize the conference in Pittsburgh with funding support from the Sloan Foundation and the Russell Sage Foundation. Loewenstein was quick to point out the value of unstructured discussion among academics. "Modeling belief-based utility is important but tricky," Loewenstein said during the discussion he led at the conference. "Traditional economics, using data based on prices and consumption, lends itself to statistical modeling, while belief-based utility does not; data such as beliefs, morals and narratives have unclear constraints." The ensuing discussion focused on how to do economics when much of what matters is purely 'in the mind.' David Huffman, an economics professor who has taught at the University of Oxford and the University of Pittsburgh, found the conference related to his current research on overconfidence in decision-making. Harvard University doctoral student Hyunjin Kim attended on a conference scholarship and found it relevant to her research in how managers adopt and diffuse beliefs in corporate culture. Discussions on the topic of belief-based utility touched on consumerism, medical and insurance industries, business management, politics and more, ranging from how doctors prescribe antibiotics to job displacement from automation. "There can be relationships between studying things we may not think are related, such as music and economics. We shouldn't be dissuaded because we think that something is not amenable to our technology or relevant to economics because ultimately it could be—and also it could tell us something. Maybe the way people consume music tells us other aspects of how they value consumption," said Roberto Weber, professor of economics at the University of Zurich. Harnessing the ability to predict belief-based decisions could become a holy grail among economists and psychologists, public-serving organizations and corporations eager to figure out what consumers will want next. "The conference has trail-blazed new research paths about belief-based utility," said Golman. The new ways we make decisions in the Information Age is generating a buzz and intensifying the emerging field of behavioral economics. A second event at CMU during the same week also promoted scholarly inquiry in behavioral economics. Faculty and students from universities around the world met at the Early-Career Behavioral Economics Conference, sponsored by the Russell Sage Foundation and also hosted by the Department of Social and Decision Sciences. It brought together a group of junior researchers who are working on a diverse range of topics in behavioral economics. Participants were selected from over 200 applications and traveled to the conference from institutions such as the University College London, Oxford University, the University of Sydney, Stanford, Harvard University and others. The presentation topics covered a wide variety of areas, including media censorship in China, gender discrimination in the medical sector and how people choose to avoid media articles about refugees to avoid feeling obliged to help. Loewenstein and Linda Babcock, the James M. Walton Professor of Economics and head of the Department of Social and Decision Sciences, delivered the keynote speeches. "The conference was an outstanding success, with incredibly high quality and innovative research presentations. 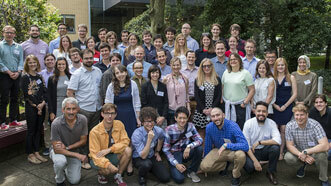 It is truly inspiring to see so many young scholars working on so many interesting topics. I am looking forward to the next iteration, which will take place in Bergen, Norway next year" said Silvia Saccardo, assistant professor of social and decision sciences and one of the organizers. Loewenstein added, "These were the most consistently interesting talks I have heard at any meeting. If this represents the new wave of behavioral economics, then its future is very bright indeed."